Last Saturday was perfect weather for having our baby shower. It was as if we ordered a perfect summer's day. 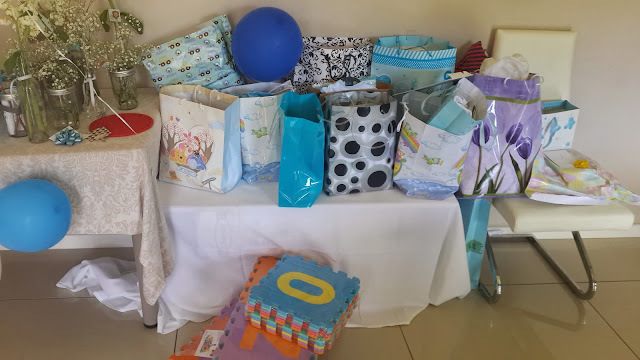 It wasn't a surprise shower as I was quite determined I do not want to go through the traditional way of how mum-to-bes are ridiculed for the sake of fun. With my hormones raging, I am sure I would have screamed at the top of my lungs if I am forced to sift through flour to find gummy bears or forced to drink overly sweet syrups if I don't know what is meconium. So, Ian and I decided we would rather have a celebration where both the men and ladies and even the kids are invited so we can celebrate the soon-to-arrive baby. 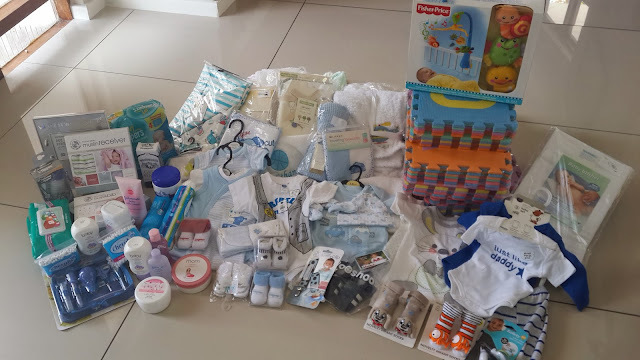 When we discussed it with our close friends, the women insisted they wanted to help to prepare the baby shower as to keep with the tradition, so they took it into their own hands to get the food ready, while I prepare the games. Early Saturday morning I laid down the table cloths, the games table, some simple flowers decor and wait for the food and guests :) We even managed to incorporate the baby names suggested by our wedding guests back in Dec 2011. It was really funny reading the names again. Hmmm, somehow the camera man only managed to take the photo of the dessert table and forgot the other table. I guess he must be busy with the food as there were abundance of them from cupcakes, to cheese platters, fruit tarts, samoosas, koeksisters, the list goes on. Baby names suggested by our wedding guests in Dec 2011. Games and gift table and two little cuties waiting for their mum. The idea is that nobody should be forced to play baby shower games while sitting in a circle :-) Therefore, I made it that the games are there on the table, who wants to play it can do so. If you have to leave early with other appointments, you can do so and come back to join us again if they can. So I had the 'Pin-the-sperm' game, 'Baby scramble', 'Beer bottles' and the traditional 'Candy Counting' game for the day. Coincidently, the Currie Cup semi-finals was on that day, with Western Province - Lions game, we made sure our DSTV is working so they can enjoy the game before the celebration begins, while the kiddies and parents are all downstairs enjoying a swim or just laze in the garden. It was really a relaxing day, where everyone does whatever they want to while catching up and spending time with each other. Ahh... I really don't know how they can stand the cold water ! The only time when we got the group together is during the gift opening session. Although reluctant at first, I later realized that most people enjoy seeing what cute baby stuff everyone got for us. So we just announced to the people that we are opening the gifts, and they can choose to join or continue with whatever they are busy with. It was really a very enjoyable and relaxing day. As the day came to an end, the women cuddled at the kitchen island, enjoying some coffee. While kids strutting their stuff dancing along with a sing-along dvd. ABC, 123, swing your hips! I am really grateful to have friends for making this celebration so special. The gifts came in so handy and I'm sure baby is going to love them as much as we do! Hi, how does 'pin the sperm' game works? Hi Thumz, each guest has his/her own personalised "sperm". They stick their sperms to wherever they want on the uterus. Later in the afternoon, the preggy mum will be blindfolded and pin her "egg" on the uterus. The closest "sperm" to the "egg" wins!